Revisitations? The mixed-media piece above, titled “Ella Quien Piensa (She Who Thinks)”, is one of two commissioned by our friend Susan … and the last time she bought art from me was in 2004, after my quintuple bypass. Then, I’d begun painting in earnest for the first time and she bought two pieces; 8 years on I’ve had another cut-up and she’s come calling for two more. Also, the media used to create this piece — Dr. Martin’s radiant dyes, Prismacolor colored pencils —I haven’t used for ages. Both working for Susan, and using these materials again, were pleasurable experiences that felt comfortable and easy in spite of the years between. I’m beginning work on her second piece and it will be very different from this first one, with a strange old 3-D frame that I plan to blend in with the artwork it surrounds. Susan, true patroness of the arts and believer in (my) artistic freedom, didn’t flinch at all when I described my idea to her! One more reason I enjoyed working on this piece so much is that I have a studio again, something I haven’t had since we lived in Long Beach and I had a whole two-bedroom house of my own to work in. 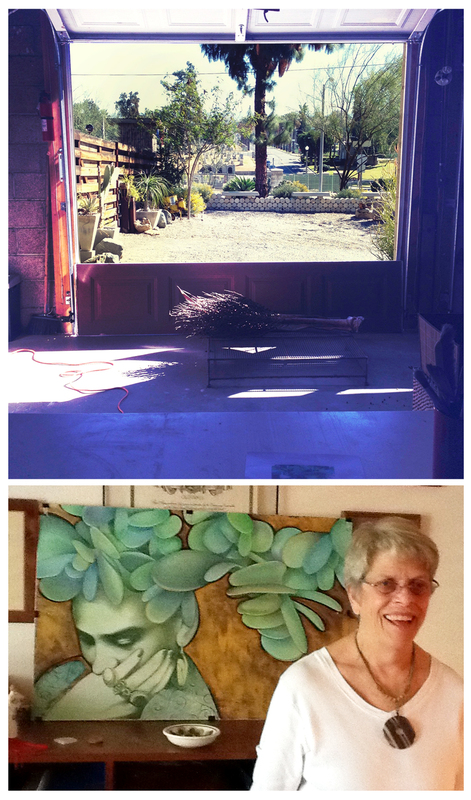 At the Rancho, my studio’s our two-car garage … that’s the view from my huge drawing table above. We finally cleared out the garden items and other miscellany it used to house, to make it usable as a workspace. And space is the operative word … I have space to lay my materials out, space for storage, space to spread out and space to work comfortably. With this new studio, and my separate office, I have just about the same combined space as I had back then and it’s great. And, speaking of great, that’s Susan with her new painting, which I’m in the process of having framed … Revisiting the past? Who knew it could feel so good! Oh wow… That is truly beautiful Reuben. I can’t wait to see the other one. I love your new space, it has great energy…It would would be great to hang out and watch you work. Thanks! And, ever since you were over I’ve been wanting to have you back to collaborate on something … stand by! Okay, I’m standing by… with anticipation. I love your painting, Reuben. It is so beautiful both in concept and in execution. You are so multi-talented! Thanks, Carol … I don’t paint as often as in the past so I appreciate the comment! I agree with Carol…she said it perfectly Reuben. 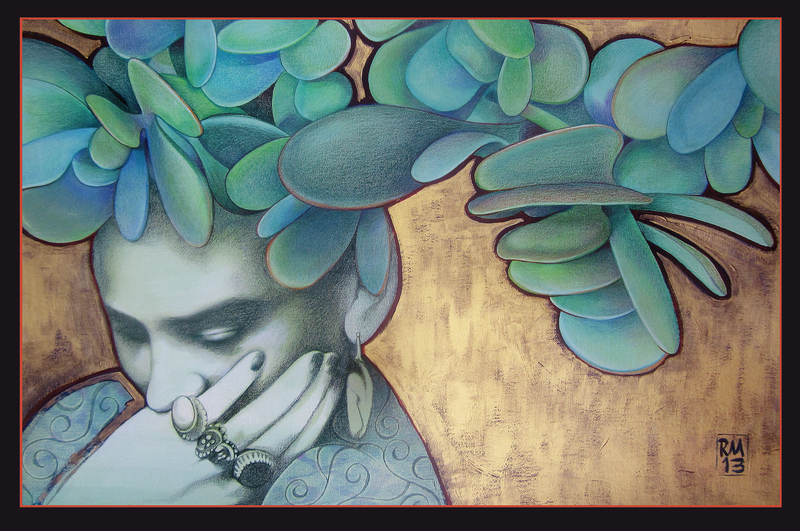 I love the title of my new painting, “Ella Quien Pensa”…es perfecto! I love your creativity! I can’t wait to see the next painting for my “Faces Collection”!. Beautiful, Reuben. I love how you integrated the Jade Plant leaves into the subject’s headdress. Thanks, J.A., I literally upended my original plan and I think it worked!